Boeing and SpiceJet celebrated the delivery of the carrier’s first 737 MAX 8 (VT-MAX). The airline plans to use the 737 MAX to expand and standardize its fleet, while leveraging the super-efficient jet to reduce fuel costs per airplane by $1.5 million a year. SpiceJet’s first 737 MAX 8 takes-off from Boeing Field in Seattle, Washington (Craig Larson photo). SpiceJet’s new 737 MAX airplanes arrive at a time when India’s commercial aviation market continues to grow at significant rates. According to industry data, domestic air traffic in India has grown about 20 percent in each of the past four years with an upward growth trajectory going forward. In preparation for their new 737 MAX, SpiceJet signed up to leverage Boeing Global Services’ tailored flight simulator and maintenance training, which will help train SpiceJet’s world-class pilots and mechanics in all areas of 737 MAX flight operations, resulting in maximized cost-savings. The airline also employs Onboard Performance Tool, powered by Boeing AnalytX, which allows flight crews and ground personnel to perform real-time calculations based on current weather and runway conditions, improving efficiency and maximizing payloads. The 737 MAX 8 is part of a family of airplanes that offer about 130 to 230 seats and the ability to fly up to 3,850 nautical miles (7,130 kilometers) or nearly eight hours of flight. For SpiceJet’s full fleet of up to 205 airplanes, the MAX will emit up to 750,000 fewer metric tons of CO2 and save up to 240,000 metric tons of fuel per year, which translates to more than $317 million in cost savings annually*. 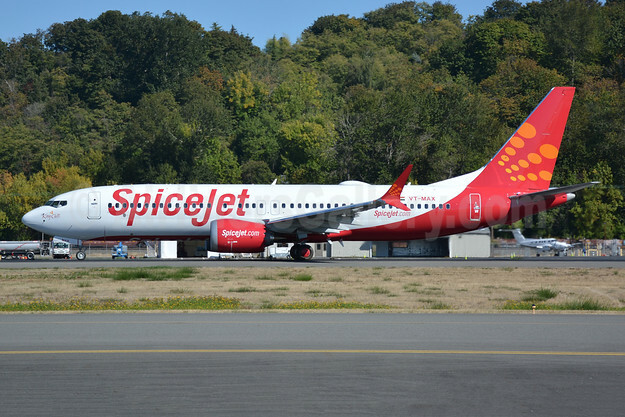 Top Copyright Photo (all others by Boeing): SpiceJet Boeing 737-8 MAX 8 VT-MAX (msn 60644) BFI (Joe G. Walker). Image: 943613. This entry was posted in SpiceJet and tagged Boeing 737-8 MAX 8, msn 60644, SpiceJet, VT-MAX on October 12, 2018 by Bruce Drum.